Creating a renewable and sustainable source of energy from hydrogen that is also affordable could be unlocked with a university’s innovative use of screen-printed nanotechnology. Researchers at Manchester Metropolitan University will test a way to provide a green source of power that could be harnessed by remote communities who are off the electricity grid and reliant on imported diesel and petrol for generators. It builds on previous Manchester Metropolitan University proof of concept work into finding an alternate way of manufacturing electrodes that are used in electrolysers to convert water into oxygen and hydrogen. These devices are reliant on components made out of expensive platinum and iridium, metal elements whose cost prohibits cheap reproduction. Under the project, the Manchester Metropolitan University team – lead by Craig Banks, Professor in Electrochemical and Nanotechnology – plan to screen print a succession of electrodes with the necessary graphene-like nanotechnology embedded in the fluid carbon-based printer ink. The screen-printing technique, which will take place at the University’s new £4million Manchester Fuel Cell Innovation Centre, would enable the electrodes to be printed in novel geometries as well as allowing them to be mass produced for industrial applications. 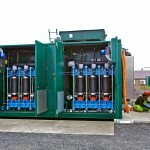 Manchester Metropolitan University’s prototype electrodes will be fitted into a stack of water electrolysis cells that then will be ‘harsh weather tested’ on Scotland’s Orkney archipelago. The researchers are collaborating with the European Marine Energy Centre (EMEC), the world-leading test and development centre for wave and tidal devices based on Orkney, Scotland, to research the capabilities and performance of the screen-printed electrolysers, the cells and the fuel cells. 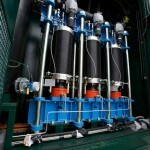 There will be six months of electrode development at the University followed by installation of the electrolyser stack in Scotland and connection to a renewable energy system and a further six months’ testing. “The electricity generated by wind, wave, tidal and solar power is often ill correlated to consumer demand and typically has to be fed into the National Grid where it is used instantly or must be expensively captured somehow, such as in a battery – which has issues with degradation – or else the turbines have to be shut off to ensure the generated electricity does not overload the electricity grid. “That means it is difficult to balance the electricity being generated to the level of demand. “In contrast, an electrolyser creates hydrogen that can be easily stored and physically transported as a gas with no deterioration and then later fed into a fuel cell for conversion to power when needed. 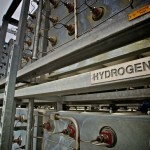 Manchester Metropolitan University won a £100,000 grant from Engineering and Physical Sciences Research Council to pursue the research, one of only two successful projects in a funding stream reserved for developing materials for hydrogen production. The electrolyser cell casings will be 3D printed at the University’s new digital training centre PrintCity that opened this spring as a hub for innovation, education and collaboration. With Prof Banks as the academic lead, the state-of-the-art PrintCity laboratory provides advice, training, teaching, consultancy and production services in the area of advanced additive and subtractive manufacturing. “We are at the forefront of 2D nanotechnology printing, building on previous research conducted here and elsewhere. “Isolated communities often need to be self-sufficient in terms of their energy generation but rely on expensive imported fuel due to often being geographically too isolated for a gas supply to be piped to them. “This is the perfect opportunity to explore whether we can produce a less polluting alternative to current fossil fuel-based energy generation techniques.